Mousehole (pronounced "Mowzel") is a picturesque Cornish fishing village set approximately 4 km south of Penzance. Stout stone quays enclose an old-fashioned harbor full of moored yachts and fishing boats. Whitewashed cottages and narrow streets climb the hillside above the harbor and there is the distinct smell of salt and fish in the air. Just 400 meters offshore the waves ripple against the rocks of St Clements Island. Long before the rise of Penzance, Mousehole was a principle port on Mounts Bay and the village was a pleasant place to live; but two tragic events have blighted the history of this quaint old village. In 1595 the Spanish raided the villages around Mounts Bay and the Mousehole was burned to the ground, only the Keigwin pub escaping destruction. The building, now a private house, has an inscription stating: "Squire Jenkyn Keigwin was killed here 23rd July 1595 defending this house against the Spaniards". In more modern times, the disaster of the 19th December 1981, when the Penlee lifeboat and its entire crew of eight, all local men, were lost during an attempted rescue in hurricane-force winds again brought sorrow to the whole village. In December, thousands flock to Mousehole to enjoy the spectacular Christmas lights. On Tom Bawcock's Eve (December 23rd) a monstrous fish pie is baked and consumed on the quayside. This is said to commemorate a 16th Century fisherman named Tom Bawcock who put to sea during a winter storm to bring home a bumper catch to feed the starving villagers. This festival is the inspiration behind the book The Mousehole Cat by Antonia Barber which resulted in a number of television productions. The Merry Maidens is late Neolithic stone circle located some 3 km from Mousehole in a field close to the B3315, Newlyn-to-Land's End road. It is the best preserved stone circle in Cornwall and consists of nineteen granite stones forming a perfect circle about 24 metres in diameter. The name is said to spring from the cautionary tale that the stones were once a group of frivolous young girls who were petrified for dancing on the Sabbath. In a field close by, a pair of stones are said to be the petrified pipers who played for the dancers. 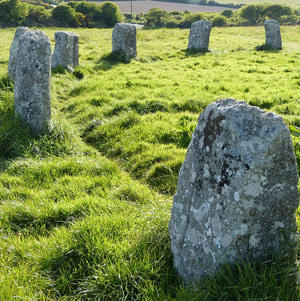 The circle is also known as the Dawn's Men from the Cornish Dans Maen ("Stone Dance"). What curious rituals took place at this and other ancient stone circles will probably never be known. Porthcurno is a sandy cove some 6 km west of Mousehole known mainly from its past history as a telegraph cable station, last used in the late 19th century. Porthcurno's remote beach was selected for the termination of international submarine cables, stretching all the way from Britain to India. This quiet cove was chosen because there was less risk of damage to the cables caused by ships' anchors. The concrete hut on the beach, where the incoming cables were connected, is now a listed building, and can be visited as part of the Porthcurno Telegraph Museum. About half an hour's walk from the cove can be found the Logan Rock, an 80 tonne granite rocking stone, perched on an outcrop of rock. 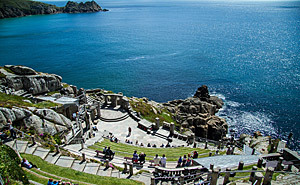 The Minack is a dramatic open-air theatre set on the Cornish cliffs close to Porthcurno. The unique setting was the dream of Rowena Cade who personally carried out much of the work to create this inspired place. She toiled for years aided by her gardener and one or two other helpers to create a terrace and stages of seating above a gully in her cliff-top garden. All materials had to be hauled down from the house or up the winding path from the beach below. Today the Minack is in use from June to September for a full summer season of plays, each performance being played out against the magnificent backdrop of the ocean. Both UK companies and groups from the USA enjoy this unusual stage. The remainder of the year the theatre is open to visitors. Lamorna Cove is located 2 km west of Mousehole and lies in a fertile valley with a pleasant stream. A few cottages and a pub named "The Wink" make up this tiny hamlet. "Wink" refers to the days of smuggling when a wink from the landlord signified that contraband drinks were available at the bar. In the late nineteenth century Lamorna became popular with artists of the Newlyn School. It is particularly associated with the artist Lamorna Birch who lived here and took his name from the place. Others in the colony included Alfred Munnings and Laura and Harold Knight.